In days gone by, patenting was a numbers game. 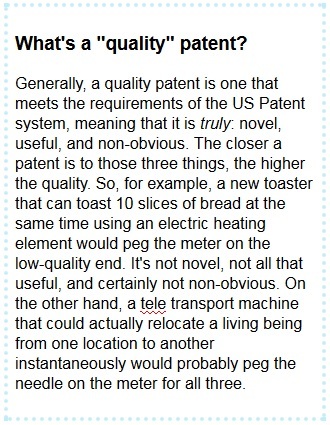 Quantity was prized, quality was brushed aside, and whoever held the most patents was deemed the winner. The size of your patent arsenal was the focus, not what the arsenal could actually do for you. Ironically, the rise of the troll phenomenon was the last gasp of the old world and highlighted the fallacy of patents without quality. This bad behavior helped draw the attention necessary to spur a tectonic shift. Fortunately, innovators are now moving away from creating untargeted, mass-produced innovations that aim only to secure as many patents as possible, and they’re moving toward precise innovation centered around specific product and market needs. This change emphasizes generating real, tangible ROI and improves the IP field for all stakeholders. Recent events conducted by the United States Patent and Trademark Office (USPTO) have clearly reflected this shift toward emphasizing patent quality. Two of the events, the Crowdsourcing Roundtables held in April and December 2014, focused on the impact of crowdsourcing. The third offered a platform to discuss potential changes within the USPTO in hopes of continuing to improve patent quality on a broader scale. This event, the Enhanced Patent Quality Summit held in March, was the first of its kind. Such public discussions help the office to stay in tune with public opinion and drive internal improvements. They also serve as an indicator that the USPTO is trying to respond to market demands and patent system imperfections. It is trying to position itself as a leader in the movement and a catalyst for the shift toward quality across the industry. In 2012, a total of only 15 CBMs were filed, as compared with 172 filings in 2014. That’s an average increase of almost 300 percent every year. The number of IPR filings in 2012 was a paltry 94. Last year, the total spiked to 1,495 filings, representing an increase by almost 12x over a two-year period. What does this tell us? First, patent system users are ambitiously taking advantage of these quality-focused tools. Second, patent applicants are beginning to see the risk in betting the farm on the presumption of validity, as opposed to making an investment in the actual quality of the patent. Further to the absolute numbers, many filers are winning the quality argument, making the investment in low-quality patents an increasingly higher risk proposition. Betting on low quality is always a risky tactic – rather, it’s much safer to make an appropriate investment in quality and then take on all comers. While the use of effective pre-filing methods is skyrocketing, patent litigation is quickly plummeting. Litigation decreased at least 20 percent over the past year. This isn’t to say the patent troll problem has been completely eradicated or that litigation doesn’t still have a foothold in the industry – that would be inaccurate. But this new trend toward ensuring quality ahead of time, rather than pursuing the path of litigation after the fact, is certainly a step in the right direction. No matter your business goals, a focus on patent quality is essential. The industry — and the world — will be better for it.